We have one bathroom. One teeny tiny bathroom. But it is one of the reasons we bought our 1961 home. You all know I have a soft spot for anything black & white, so when I walked into this little classic bathroom my heart skipped a beat (especially after some of the others we had seen!) While small, it does the jobs required of it and now thanks to our new Delta In2ition 2 in 1 Shower Arm it does that job a little better. The shower wand options have not always been the most stylish options, but Delta’s attention to design has changed all that. We recently installed the In2ition 2 in 1 Shower Arm (in stainless) into our bathroom & could not be more pleased with the aesthetics as well as the functionality. 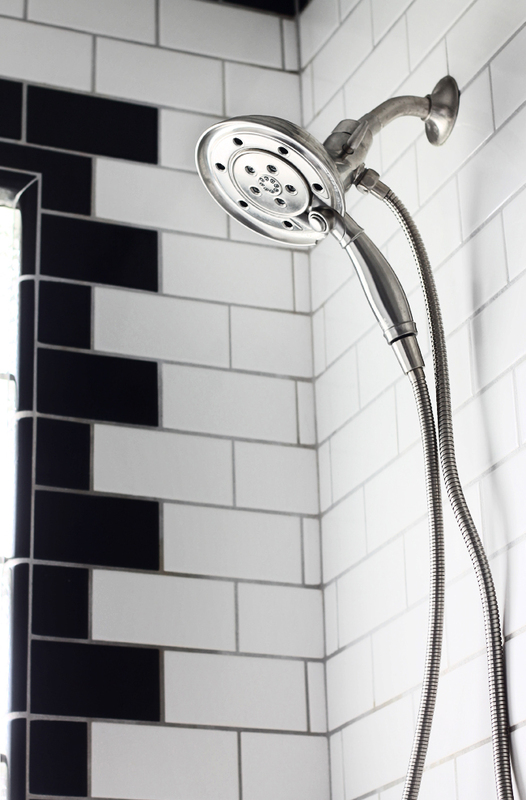 It matched perfectly with our existing fixtures & the classic lines marry well with our black & white tiles. The arm easily detaches from the larger shower head & has multiple sprayer options that fill any need you may have. The water coming through the sprayer is enhanced by Delta’s H2OKinetic Technology. Basically, this new technology allows the water to come out in larger rain like droplets which makes your existing shower feel like it has more water pressure & miraculously seems to stay warmer longer. The collection now has multiple styles & finish options to suit any decor & is a breeze to install. I did this myself (with Chloe’s assistance of course.) It simply screws onto your existing shower head’s external connection. No need to get inside the plumbing. Anyone with kids or dogs knows how difficult it can be to give them a bath & keep the soap out of their eyes. 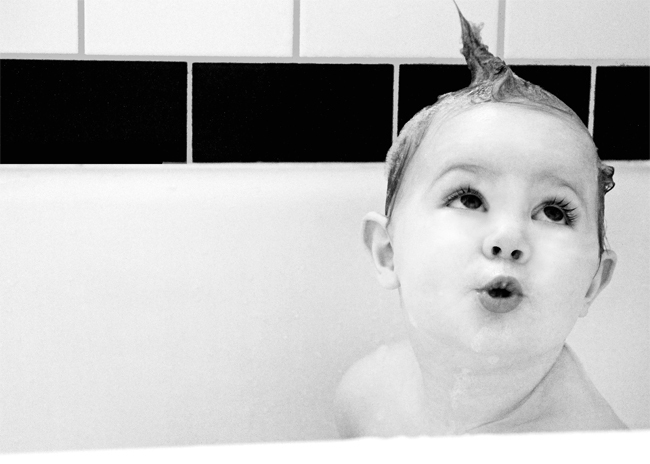 Especially during my little one’s favorite past time… bubble baths. The option of a shower arm has literally changed our bath time experience. No more tears… from the “No More Tears” shampoos & soaps. *The Delta In2ition 2 in 1Shower Arm was provided to the Hunted Interior for a Product Review. All images & opinions are my own. I am loving the black/white and gold combo! I think the link to the Delta fixture is broken. Oh, look at that cutie baby! Must be rough, being that precious. Heehee. Love that stool in the bathroom! Such a fun pop. This looks stunning! the new fixture works well in the space. Is the tile work original to the home, or did you do that as well earlier? Love the delta faucet, but love even more the curved shower rod. We went for the same one and put in a curved tub to go along with it – so useful to kid baths and adult elbows in the shower! Obsessed with the black and white tile. Love that it's original too. 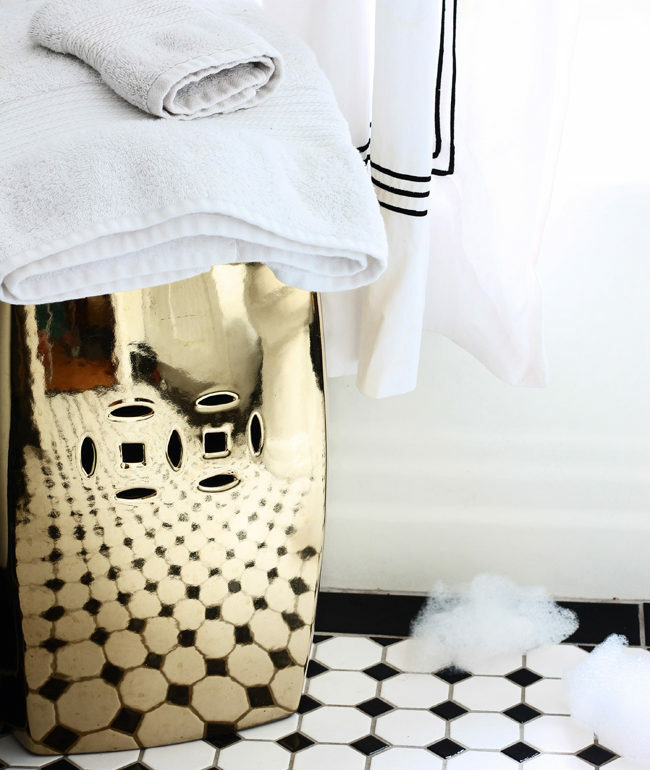 We're (hopefully) redoing our 1920s (not original and gross) bathroom soon, so this gives me inspiration! Great pics. My house too only has 1 bath and it is black and white also. I have been telling my husband that I want to put a garden stool next to the tub for months so I cannot wait to show him your post and hope it will help seal the deal. I just love that old homes (mine is 1922) have so much character. You styling wizard, you…I love that you staged soap bubbles on the floor 🙂 Chloe is the cutest little bath munchkin. My two year wants her hair like that every single bath. Every one. Great styling and a cute little babe…I'm in. Those black tile borders are brilliant! What a gem of a little bathroom! Oh man! I need one of these stat! My little girl hates getting her hair washed! Love your bathroom and your sweet little girl! What a doll! gorgeous. 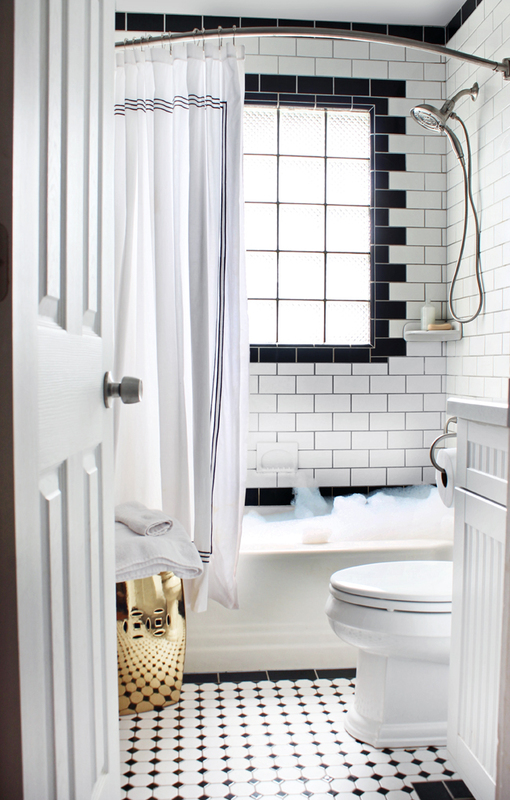 the tile in your bathroom is amazing, and it's inspiring that you only have one bathroom! That bathroom is perfect! I can see why you were sold on it from the get go! 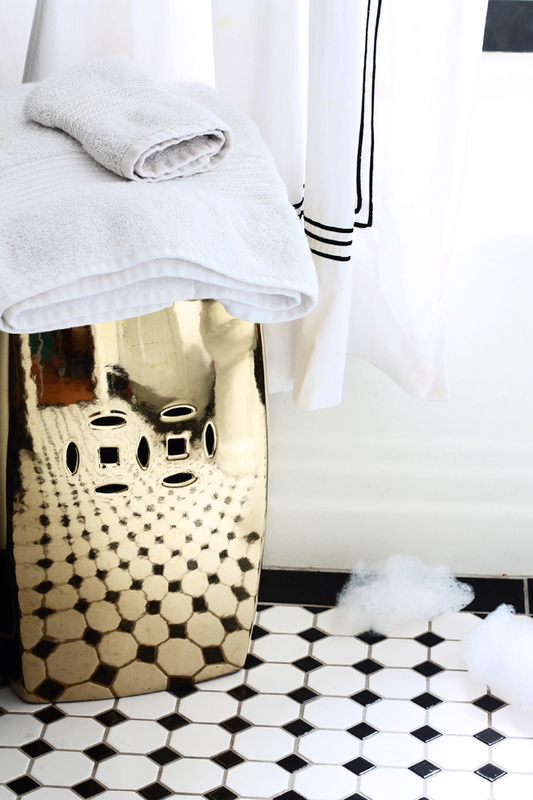 Love the styling of the bubbles in the bath! LOL. And doesn't a great shower head make the biggest difference of all?! I love black and white bathrooms. So classic and always chic! I am definitely planning to do an all B&W bathroom in our 1902 house that we're restoring. It never goes out of style! I love the black & white and the touch of gold is unexpected….love it! Love it! I grew up with a shower arm and need one in our current house too. Your staging is always the bomb! Beautiful…and never going out of style! I cant see why you fell in love with it, I have a soft spot for black and white too! So classic! Hello gorgeous bathroom…I would settle for one bathroom, too, if it looked like that. 😉 That last picture is so cute, too! I am currently living with subfloor and drywall in my bathroom, its about the same size as yours. I love this look and I'm wondering what the walls behind the door and vanity look like. Are they tiled? I love it. I have the same small bath but two adults. I want to do the white subway tile and the same floor tile you have. Your added black tile makes a classic touch for the year of the house. I had questions of what to do with the window in mine bath stall but you helped answer that. Thank you so much. My only question is how much did it cost?